Using the Windows Add/Remove feature you can easily uninstall any program, but leftover items are often left behind. These will clutter on your hard-drive and your system Registry, taking up useful storage space and even slowing down your computer’s performance. 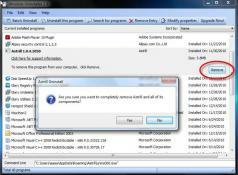 Abolute Uninstalled is a powerful alternative to the default Windows uninstall function. It ensures all data related to the uninstalled application will be removed, including log files, empty and other folders created by the program, registry entries...etc. Absolute Uninstaller offers you a friendly and intuitive solution for complete removal of your installed software so your machine remains clean and error free.